(68) baking in a storm – walking forward. While it thundered and poured rain and hail on Saturday night, I made cake. Three cakes, to be exact, along with a really great dinner. It was nice to know that I haven’t lost my knack and that I actually do still enjoy being in the kitchen. I often wonder is this food-loving Anna an authentic part of my identity? Or have I just put it on as a crowd-pleasing persona? Maybe a bit of both. But I baked and hoped the power wouldn’t go out while the cakes were in the oven and it didn’t and they were golden and smelled sweet and warm and like cardamom. 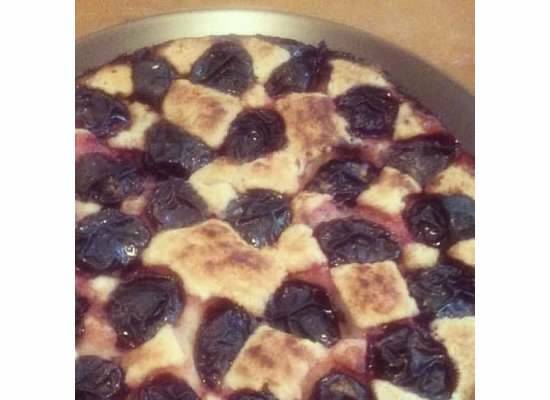 If you ever need a cake recipe that is both easy and awesome, the purple plum torte from The Essential New York Times Cookbook (Amanda Hesser) is the perfect solution. I made it with tiny squishy yellow plums that surprised us on a tree in our own backyard this time, but I’ve made it with purple plums before with equally amazing results. Every class session of life lately has been about trusting Jesus more. Even going to church is that same class, again and again. I hear the refrain everywhere, about everything. I am not exaggerating. Will I entrust this loved one to Jesus? Will I trust Him with finances? Will I trust Him when I see the places where we need to grow, but we’re just in the process and the journey is taking a long time? Will I trust about health and genetics? Will I trust again and again and again that I’m in the right space at the right time and just rest here? Will I trust that He will guide me as I seek to be a Christ-follower, probably even regardless of what church I am affiliated with? After my last post, someone told me that we don’t often get answers to our questions, but we do receive grace to live in the questions. Which of course reminds me of what may very well become my life quote, given the way it keeps circling back to perfectly explaining where I am: “Be patient with all that is unsolved in your heart and try to love the questions themselves…” (R. M. Rilke). Lately the struggles feel repetitive. It’s the end of August and I’m disappointed I haven’t read as many books this year or learned that piano piece I thought I wanted to learn or… You know that even the things that could be fun and relaxing leisure activities become goal-oriented exercises for me? I can’t just read for fun (because I’ll never sit down and do it), so I set a goal to read a book or month, but still feel ashamed because I used to read a book a week (when was that? maybe that was possible because I was 12?). There might be a better way for me to set myself up for success in life. Does anyone else feel like instead of growing straight up like a sunflower, growth feels more like the dizzying monotony of a merry-go-round? I feel like I have been living in life’s waiting room for a while now and I’m making the best of it, I think. What a perfect place to continue learning to live the questions in. This entry was posted in Growing up, Just write and tagged food, messiness. Bookmark the permalink. Living in life’s waiting room–oh, yes, I can identify!! And we share a love for the Rilke quote–“Be patient with all that is unsolved in your heart and try to love the questions themselves…” Loving the questions, welcoming the uncertainty, embracing the waiting–so easy in theory, so hard in practice!! Thanks for putting into words what so many of us are feeling!1 I sense that God is smiling when he thinks of you–so am I ! !